Aeromium Barcode Fonts comes bundled with formulas to help you create barcodes in Crystal Reports easily. This tutorial is specially designed to get you started in generating barcodes in your reports. 1. Ensure the appropriate Aeromium Barcode Fonts and Crystal Reports are installed. Note - The trial version of Aeromium can also be used in this tutorial. 2. Launch Crystal Reports from the Windows Start Menu. Create a new report or use your existing report for the following steps. 1. In the Field Explorer, create a new formula by right clicking Formula Fields and select the New item in the context menu. 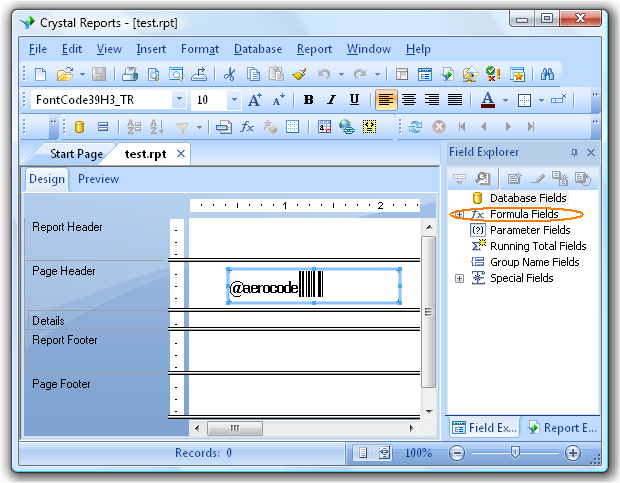 Note - If you cannot see the Field Explorer, click on the menu View->Field Explorer in Crystal Report. 3. You will now see the Formula Workshop - Formula Editor. Change the syntax from "Crystal Syntax" to "Basic Syntax". 4. Copy and paste the formula for the barcode that you intend to use from the file AeromiumBarcodeFormulasForCrystalReport.txt to the Crystal Report's Formula Editor. The text file can be found in the CrystalReports subdirectory of Aeromium Barcode Fonts. 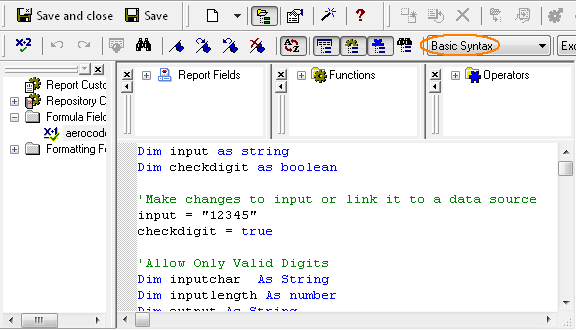 The table below shows the barcode and their corresponding formulas in the AeromiumBarcodeFormulasForCrystalReport.txt text file. 5. Modify the 'data = "12345678' statement to encode the specific data or alternatively set it to a data source field. 6. Save the formula and drag it to your report to create a formula field. 7. Set the font of the formula field to the appropriate barcode font. For example, for Code 39, the font can be FontCode39H3. Note - The font preview in the drop down list of Crystal Reports may appear as barcodes.